Easy to use. 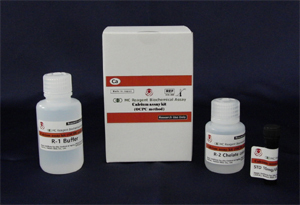 For cell lysates, serum, plasma and wide variety of biological samples. Calcium is the most abundant mineral which accounts for 1.5-2.9% of body weight, and is an important element in the formation of bone and cartilaginous tissues. In the human bodies, 90% of the calcium is present as hydroxyapatite in bone, 1% is in cells, and 0.1% is in the blood. Calcium is known to plays important roles in various physiological functions such as osmotic homeostasis, blood clotting, muscle atrophy, nerve stimulation, and the activation of enzymes. In blood, 45% of calcium is attached to albumin or globulin, 10% is present as phosphate salt, and 45% exist as free ion. o-Cresolphthalein Complexone (OCPC) and calcium can form a chelate complex with deep red color. The concentration of calcium can be determined by the absorbance at 570 nm. 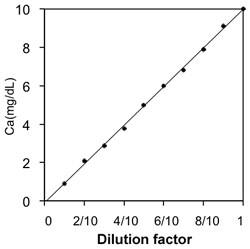 Although most OCPC-based calcium assay has sigmoid-shaped calibration plot, the calibration plot of this kit is linear and the calcium concentration can be estimated by simple one-point calibration. Applications: Serum, plasma, urine, saliva, cell lysate, tissue extract, plant extract, hair extract, food extract and water. The effect of 15 mg / dL of magnesium is less than 10%. Will be affected by EDTA. Storage temperature: 2 - 8°C (don't freeze). Expiry date: 1 year after the day of manufacturing. Apoplastic mesophyll signals induce rapid stomatal responses to CO2 in Commelina communis. Strawberry notch homologue 2 regulates osteoclast fusion by enhancing the expression of DC-STAMP. The pga gene cluster in Aggregatibacter actinomycetemcomitans is necessary for the development of natural competence in Ca(2+) -promoted biofilms.